These posts might be more meandering than my usual review since I'm doing them more stream of consciousness than my normal take. My anticipation is growing. Well, gnawing at me really. All for The Wise Man's Fear. I've mentioned a little here and there, but in case you're a new reader I'll fill you in. 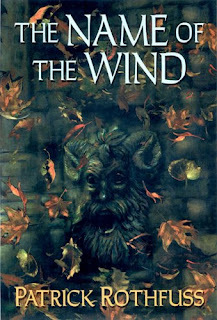 If it weren't for Patrick Rothfuss's The Name of the Wind I probably wouldn't be blogging today. It was that book that made be delve deeper and deeper into book review sites such as John, Ken, Aidan, and Pat's places most of whom did interviews with Rothfuss. From there they led me into a world I thought I was involved with, but it turned me from a mere reader to a bonefide bookaholic for every shred of news I could find. Firstly, I'm very glad to have started this re-read. I kept promising myself I would, but new books kept coming up and I've re-read only a few books since I started blogging. 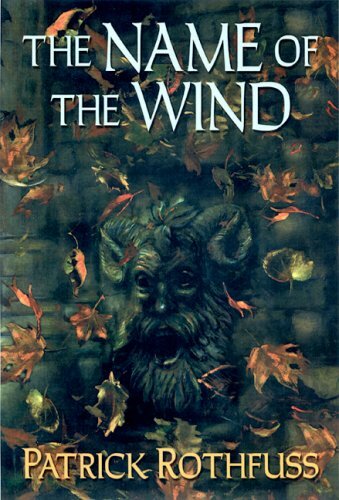 I first read The Name of the Wind the week it was released and re-read it once a few months after, but now, more than 3 years later, all of the details have faded from my mind except for some of the big happenings and a few particular scenes at the University. The story starts much slower than I remembered and does tend to be overly detailed at times, which worries me a little about The Wise Man's Fear given it is half as long again as The Name of the Wind. But the love of the characters comes across immediately and there is no doubt it is a highly compelling read. The language of The Name of the Wind is deceptively simple. Rothfuss doesn't thrown in a 10 dollar word when a 50 cent one works just fine, which helps the flow easily from one chapter to the next and probably accounts for why people of almost any age find it so engaging. It is certainly just as hard to put down as when I first read it as I kept telling myself the past few nights. "Just another chapter. It is only a few pages long and than to bed." "Well maybe just another. I can't stop at this point." "Crap I should have been asleep an hour ago." Whole parts of the story were lost to me. Oh, yeah the Chandrian. Wasn't that something in the beginning of the book? The story is a very slow build, but Rothfuss does sow the seeds of anticipation well if not too heavily at times. Talk about foreshadowing, which can be a bit too much with all the tell and not enough of the show. I forgot how intricate the mythology of this world is and how much was covered in the first two hundred pages along with the sly drops about what is to come that I'm probably reading too much into. All the connections and stories about Lanre and the Chandrian seem much more central to the story than I remembered, which has given me a better sense of where things will go in the future. Young Kvothe can get annoying. Oh, he is super smart. Oh, he can pick up any skill within hours including languages. His fiery red hair will set the world ablaze. He is just too good at everything and no reason is given in particular. Maybe it will come up in a later volume, but it seems doubtful. It is also possible throwing in a noble bloodline or demon blood of some sort would dilute his accomplishments. Still Kvothe is endearing and as the story progresses it fades. Having the scenes at the inn help temper things with young Kvothe as it seems deservedly so and does draw you to his plight and battle for survival. This is a guy that inspires legends and lives up to the tales even after some myths are dissembled. While the story is told from Kvothe's point of view the secondary characters are given a lot of life even if they are only around for a few pages. The world at large is very sketchy. While the scenes are described well the hierarchy and most groups are only alluded to at a few points. No real power structure or places of importance are delved into save the University. It is all about Kvothe, but I don't think I'd have it any other way. I hope we see a lot more of Skarpi, but I don't think he is in the rest of The Name of the Wind. I should also add I'm enjoy the heck out of the book all over again. UPDATE: Part 2 of my re-read is now up here. I need to reread it as well. I did recall youngster Kvothe being kind of a snot, but he's 9 years old, that's was kids that age do. And maybe that's some build up unto itself. Being super good at everything when you are a child turns you into a super overconfident and arrogant teen or adult, and the higher you climb the harder you fall. It has taken Pat Rothfuss so long to get the second book finished and off to the publisher --- I'm thinking I'll have to re-read the first one just so I can remember what was happening when it left off. @redhead - Most of the first part Kvothe is 11-12, which can be the snotty time and it certainly does help with the build-up. @Jo - Precisely the reason I wanted to undertake the re-read. I have another bigger re-read planned for one a certain book is officially announced. I just started reading this over the break for the first time and completely loving it. I can see why it's garnered so much praise. It's slow, but I like slow sometimes, and the characters feel like your best friends. "It's slow, but I like slow sometimes, and the characters feel like your best friends." I've read both The Name of the Wind and Wise man's fear, and as far as I can tell, Kvothe doesn't seem almighty. IF you look back, you'll notice that he's really bad with numbers and arithmetic, has real problems learning Yillish, making no real progress for months, he doesn't really answer all of his admission interview questions correctly even after he finds time to learn, he never really learned Ketan to be better than a 12year old Adam girl, nor did he master the Adam hand language, he doesn't understand things that don't come from the rational part of the brain, like the sleeping mind or the Lethani.The only real skills that allow him to do the things he does are his extraordinary memory, musical skills (which allows him to have dexterous fingers) and his stage training. Apart from that, ok, he has "a knack" for certain things, but, most of them are connected to good memory. He still make horrible mistakes and doesn't really win in every situation. And as we see later in the series, he lost most if not all of his powers, and is reduced to be a simple man. I don't think that the series needs Kvothe to have some arcane/daemon heritage to make it more believable, it'd have the opposite effect, making Kvothe look more powerful and special than he really is.